KHIND Holdings Berhad’s transformation from a small homegrown entity into a global enterprise was a source of inspiration for close to a thousand INTI students with front seat access to the man who has been credited as the primary driving force behind the company’s remarkable journey to global success. Cheng Ping Keat believes it is vital to understand Gen-Y for business success. 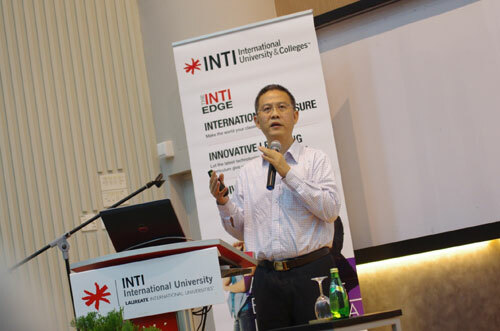 Cheng Ping Keat, Group CEO of KHIND, was at INTI International University to share how a small family-owned service provider in the early 60s, through business acumen and enterprising chutzpah, was able to become one of the country’s leading producers of world-class electrical home appliances today. His presentation was part of INTI’s Business Leadership Series (BLS) which has seen prominent corporate leaders such as Google Malaysia’s Sajith Sivanandan, Frost & Sullivan’s Manoj Menon, IBM’s Ramanathan Sathiamutty and many others speaking to INTI students on the latest trends and developments in business and career opportunities on a global scale. He added that a company’s future and strength are determined by the quality of its employees and its ability to innovate; which is key to its competitiveness and market share in the global market. “Throughout the various phases of the business’ evolution, there are different expectations. In our current value-driven phase, it is vital to understand Gen-Y, because they are or will become our employees, suppliers, customers, competitors, and also regulators. This group of people will make up the biggest population in the workforce, and also the biggest group of consumers in the market for the next five to 10 years. Therefore, it is important to transform and manage our business accordingly,” said Cheng. Held on an almost monthly basis since it was initiated in 2010 and delivered predominantly at INTI International University in Putra Nilai, BLS is also viewed via live stream by students and staff at INTI’s campuses nationwide. The opportunity to be inspired by accomplished thought leaders on a regular basis is a privilege accorded to few students outside of INTI. “INTI’s programmes are developed and constantly refined to meet the requirements of employers and the industry. Our strong links with industry partners have enabled our students to keep in constant touch with their potential employers, through visits to their work places, workshops, internships, and important projects that provide students with real world work experience,” said Jeyasothy Palakrishnar, INTI’s Vice President, Employer Relations. Innovation brings multiple industry projects that enable INTI’s students to work with employers on real business issues and solutions to gain experience and readiness for global employability. Students have undertaken over 160 innovative projects from 2012 up to June 2013 in collaboration with industry partners. Real employer projects have been introduced in the classroom to help students develop problem solving, collaboration, communication and critical thinking skills. For more information on INTI’s career-focused programmes, please call 06-7982000/ 03-5623 2800 /03-2052 2888 / 04-631 0138.